Not sure what to get that special paddler on your Christmas List? 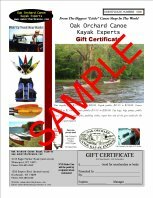 You need an Oak Orchard Canoe & Kayak Gift Certificate! Choose from $20. to $5000. - Order Online - FREE Shipping! If you want your certificate in a denomination not shown here please call to order. There are no shipping charges or sales tax on gift certificates. Sales tax will be added to all taxable purchases made with gift certificates. To redeem; the actual Gift Gertificate must be presented in one of our two stores.